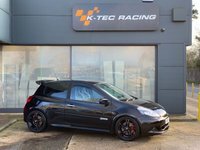 KTR Car Sales is the used car sales section of K-Tec Racing, one of the UK's leading tuning companies. We have a passion for cars which has evolved from over 15 years in the tuning industry and it is this experience and knowledge which has led us to open KTR Car Sales. We are proud to offer you a first class customer service along with a range of high quality hand picked used cars, so please browse our stock list to see if we have the right car for you. We pride ourselves on only selecting well looked after and well maintained cars which are then passed through our workshop for further inspection before being offered for sale. We endevour to describe our cars as accurately as possible as we would never want anyone to come and see one of our cars only to find it was not what they were expecting. We are happy to discuss and arrange finance requirements for any budget we can also offer part exchange on any vehicle. So if you are justing looking for your next car or want to be able to choose the right car and enhance it to your chosen specification, we are here to help. Please take some time to have a look through our website to see just how we can be of assistance, it will be our pleasure to help you with the purchase of your next car, be it standard or tuned.